(CNNMoney.com) -- Looking for skilled, low-cost labor? Forget about India and China. How about Jonesboro, Ark.? As the national unemployment rate hovers near 10%, some companies are starting to eye job-hungry areas of the country as prime candidates for the kind of outsourced work that once would have gone overseas. 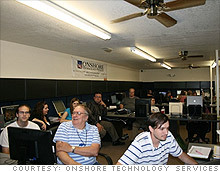 Onshore Technology's IT center in Macon, Mo. Dubbed "ruralsourcing," "rural outsourcing" and "onshoring," the practice relies on two simple premises: Smaller towns need jobs, and they offer a cheaper cost of living than urban centers. So businesses that outsource work to these areas can expect to pay less -- rates are often as much as 25% to 50% lower -- than if they were hiring urbanites with comparable skills. In response, a new crop of outsourcing startups are popping up with development centers in places like Joplin, Mo., and Eveleth, Minn., where hundreds of employees crank out software code or offer IT support for large corporate clients. "It's extremely timely given our economic climate," says Mary Lacity, an information systems professor at the University of Missouri-St. Louis who has written 12 books on outsourcing. "And I think there's a demand for it." Compared with the estimated $60-billion-a-year offshoring industry, rural outsourcing remains just a blip on the radar. Yet the strategy is becoming a more popular option for businesses that are trying to stretch their budgets. One rural outsourcer, Onshore Technology Services, recruits workers from minimum-wage jobs and gives them intensive training in IT specialties. Sixty-five people work in IT centers in the rural Missouri towns of Macon, Lebanon, and Joplin. "They're moving people from fast-food to IT jobs and letting them use their brains," Lacity says. Meanwhile, CrossUSA in Burnsville, Minn., recruits experienced, older IT workers who are nearing retirement for its 100-employee operations in Sebeka, Minn., (population 700) and Eveleth, Minn., (population 3,000). The draw for workers is the chance to make their money stretch as far as possible prior to retirement. "They're trying to figure out the best way to finish their careers, and some people want a small-town quality of life," says John Beasley, CrossUSA's director of business development. CrossUSA is growing at a 7% annual clip, with $9 million in sales last year. Its turnover rate is low -- in a town of 3,000 people, who can woo away your employees? For some companies, the thought of outsourcing work to countries with different laws and business practices feels risky. Take Human Genome Sciences, a Rockville, Md., biotech company. The 900-employee company got bids from several outsourcers to handle the technical support for its back-office software. One of those bidders, AnswerThink, would have offshored the work to India. But the idea of sending confidential company information overseas, outside the reach of American intellectual property law, didn't sit well with David Evans, an IT director at Human Genome Sciences. Instead, Evans hired Atlanta-based Rural Sourcing Inc. and its team of software experts in Jonesboro, Ark. "There's a real desire to keep things onshore," Evans says. "There's a backlash against offshoring. There are a lot of horror stories, a lot of jokes." Evans had his own stories of struggling to work on projects outsourced overseas by Human Genome Sciences' vendors. The outsourcers were in drastically different time zones, concepts were hard to communicate, and cultural differences created misunderstandings. 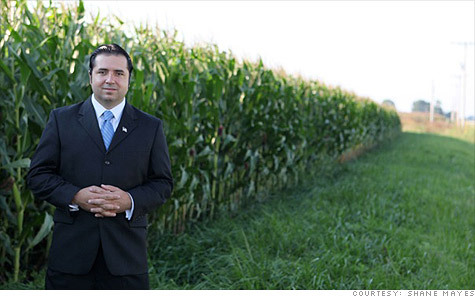 Human Genome Sciences now pays about $55 an hour for technical support from Rural Sourcing. That's about 15% higher than the rates quoted by the Indian outsourcing firm Evans considered, but half of what it would cost for him to hire a software development firm locally in the Washington, D.C., metro area. "Now when we have a problem, we can get right on the phone and talk through the issue real-time. That right there is worth the extra cost," Evans says. Launched in 2004, Rural Sourcing Inc. sets up shop in mid-size cities that are near universities -- places like Jonesboro, where the average IT salary is $35,000, versus $65,000 in a large metro area. The cost of living in Jonesboro is also 23% less than the U.S. average. Rural Sourcing now counts GlaxoSmithKline (GSK) and R.J. Reynolds as clients, and its revenues are on track to triple this year to $4 million, says CEO Monty Hamilton. The company plans to expand beyond a single center in Jonesboro and open two new IT development centers, including one in Greenville, N.C., by the year's end. "Companies are stumbling upon us, and it's growing gangbusters," Hamilton says. "There's no reason why we can't put a lot of people to work." Carlson says he and his girlfriend were grateful he got a job locally customizing back-end software systems for corporate clients. He works out of Rural Sourcing's 60-person development center, not too far from Booneville, the 5,000-person town where he grew up. "This is where we are from. Our whole lives have been here," Carlson says. But don't call Carlson "cheap labor." He bristles at the idea. After all, he says, he's doing what he wants, where he wants, and he's proud of his work, even if it doesn't come with a Silicon Valley salary. "The reason we're low-cost is because we're in a more rural area with a lower cost of living," he says. "I didn't have to sacrifice anything to get where I am."